Takayama is a city in the mountainous Hida region of Gifu Prefecture. It is about 2 hours away from Tokyo via a bullet train and a slower regional train. It’s a lovely journey that follows a river valley upwards as it climbs into the foothills of the Japanese Alps. I spent a couple of nights there in April when the daytime temperature never got above freezing. At night fresh batches of snow fell as the temperature dropped to -10 Centigrade. 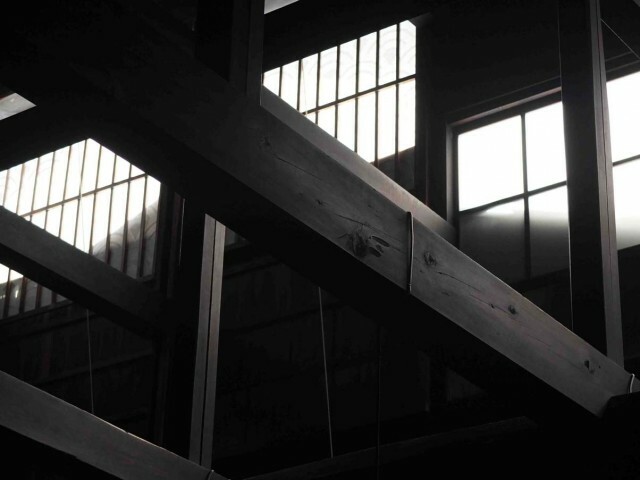 In feudal times Takayama was famous for the quality of its timber and the craftsmanship of its carpenters, evidence of which can still be found in the beautifully persevered old town which borders the river that runs through its centre. It is there that I came across the Yoshijima house, a rich merchant’s home dating from the early 1900’s. It’s a ‘living’ museum now but was part sake brewery, part shop and part home up to then. Stepping inside I was immediately struck by the ‘space’; the perfect proportions, the symmetry, the simplicity and that it was far colder than outside. The only heating in the house seemed to be provided by two small fire pits in the cavernous, beamed entrance hall, but primarily, these were for boiling water for tea and not for heating bodies. I can’t begin to imagine how this home’s former residents kept warm during the depths of winter. There were only three other visitors wandering through the rooms, so it was quiet; nonetheless it was easy to imagine the calming influence this house would have on family, customers and visitors as they went about their business. This is a solemn, peaceful house in which I could not picture raised voices or running feet or raucous laughter for that matter. 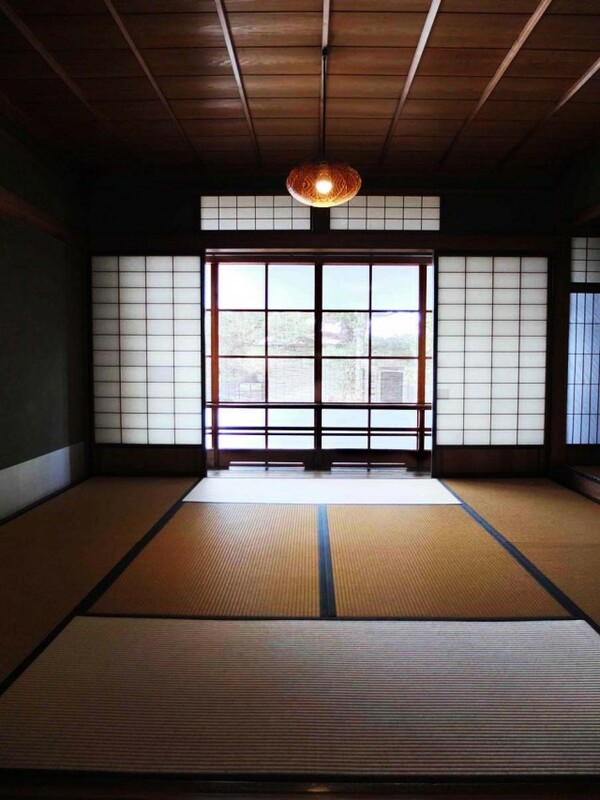 This is not a bad thing; the temple like serenity is enhanced by the muted colours of the tatami (straw) mats combined with the paper thin shoji blinds that divide the sparsely furnished space into rooms. 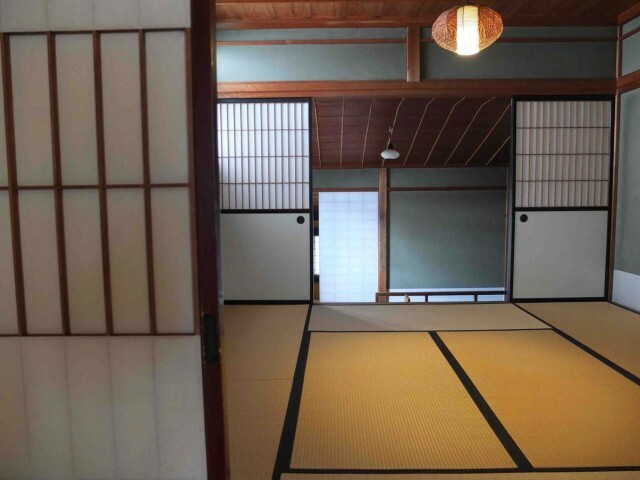 I sat down on the rough tatami mats in an upstairs room for sometime, musing about life in this house and wishing I had packed warmer clothing but it became so uncomfortably cold that I had to move on. I spent a very peaceful forty minutes wandering round this house and emerged into the relative warmth of a sunny Takayama afternoon to seek out a cup of hot sake. 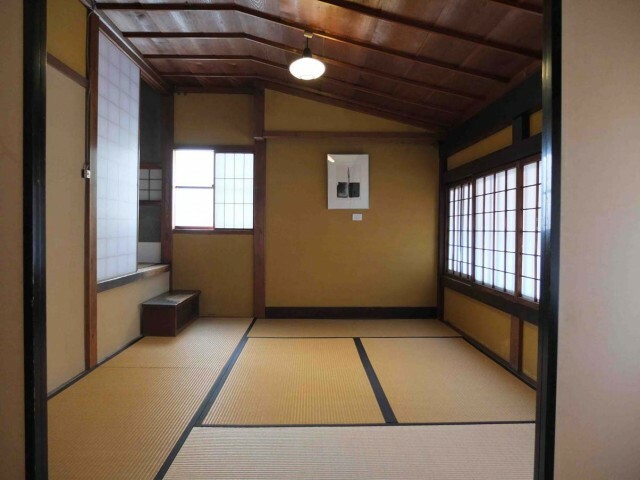 The Yoshijima family house was built in 1907 by the master carpenter Nishida Isaburo according to the traditional town house architecture of Takayama. The Yoshijima family was, at the time, a well known brewer of sake in Takayama was also engaged in money lending. The total space of the house may be divided, roughly, into five areas. The first of these is that portion taken up by the business. This consists of a room with earthen floor which one enters from the main entrance and several rooms adjacent to it, including a reception room, a room where accounts were settled and the shop itself. The great flying beams which spread out about the room with the earthen floor served not only as the symbol of the family’s standing within society, but also expressed the solidity and reliability of the business. The second main area consists of seven rooms which were used daily by the members of the family. The main room with a charcoal brazier set in the floor was used as both living room and dining room. The majority of rooms on the second floor were used by members of the family, usually by the children of the household. 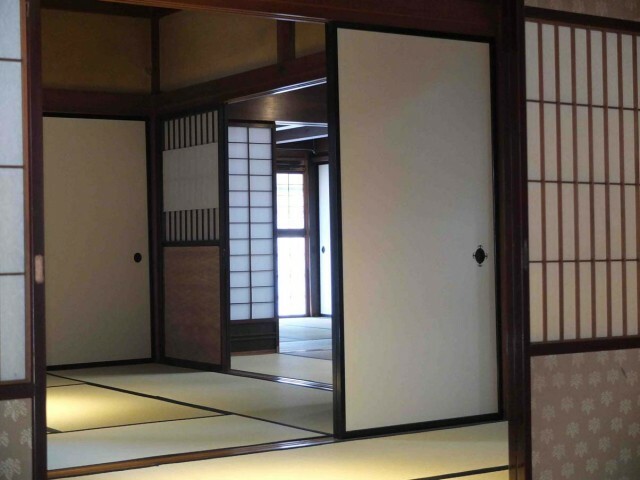 The third area consists of a room for the tea ceremony and four rooms on the second floor used for the entertainment of guests. 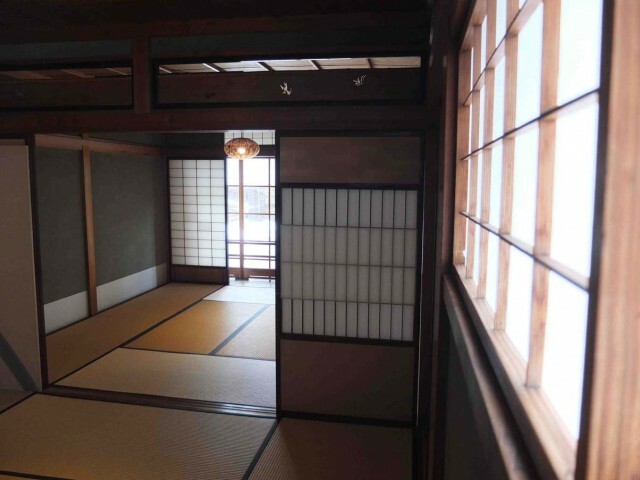 These rooms contain the tokonama alcove, an alcove with decorative shelves, a library and the family’s Buddhist altar. 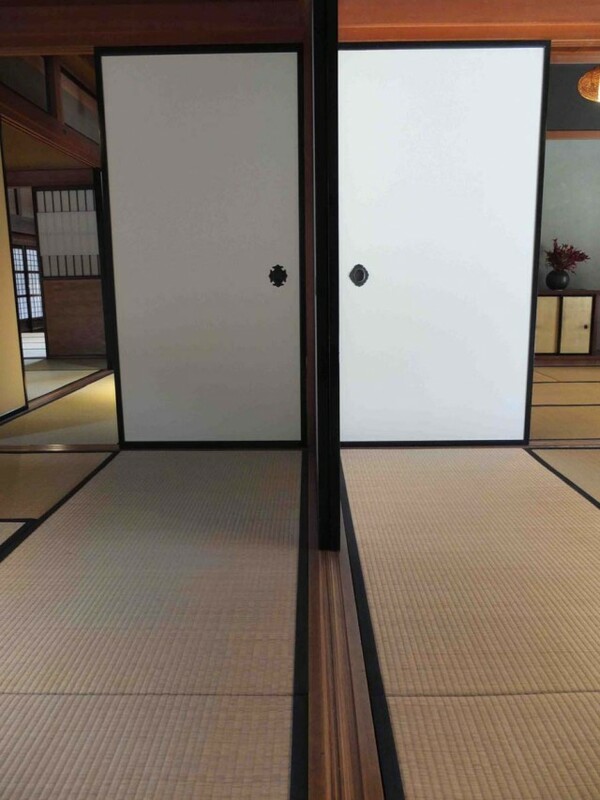 On ceremonial occasions the shoji and fusuma, or sliding doors, would be completely removed to create a single large hall. 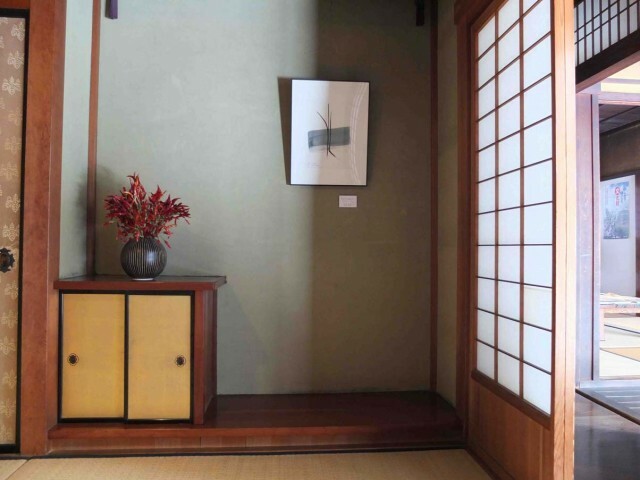 A special entranceway for the exclusive use by guests can be found in the wall which surrounds the house. Those that entered here would pass through the garden on their way to the guest rooms. The fourth area is that which was occupied by the servants of the household and by the employees of the brewery. It includes a room within the earthen floor room which was the living room, and three bedrooms, two on the second floor and one at the rear of the house. 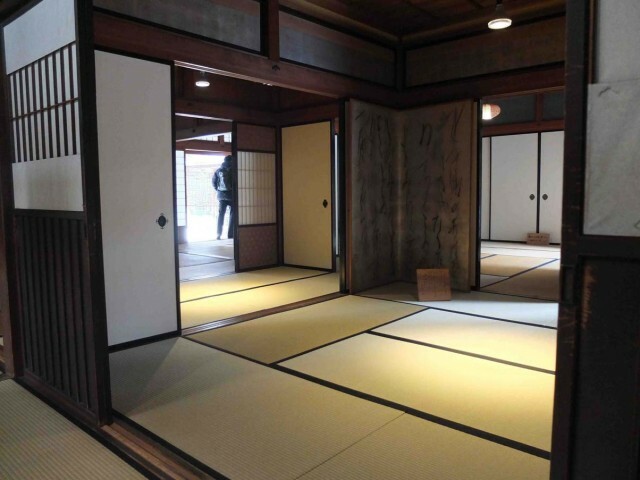 The fifth and last major area takes in the buildings where the sake was brewed and the plastered storehouses where the drink was kept prior to despatch. These rooms stood in a row behind the house; unfortunately most have been torn down, so that only a small portion of what once existed remains today. Posted on August 5, 2014 August 6, 2014 by admin. This entry was posted in Japan and tagged Takayama, Yoshijima. Bookmark the permalink.